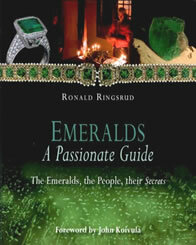 Here is one of the few books that truly covers a gemstone from the ground to a ring on a lady's finger. It deals with deposits and mining, gemstones and cutting, jewelry creation and retailing. Lots of spectacular photos, especially ones that reveal how emeralds are cut and those that investigate the microscopic flaws and features that are characteristic of these beautiful stones. This book is a 8 1/2" x 10 1/2" hardcover with 382 pages.